From the 1930s through to the 1970s, the name Opel was synonymous with affordable cars that offered a hint of Detroit flair (when that was still considered a good thing). But in the late 1950s, everyone was feeling the pinch from VW’s success. And so in 1957 Opel Product Director Karl Stief was mandated by General Motors headquarters in Detroit to develop “the perfect Anti-Volkswagen” (“einen perfekten Anti-VW”). The development team was headed up by Stief, supported by Hans Mersheimer (car-body) and Werner K. Strobel (engine and running gear), under conditions of such secrecy that even now very little is known of the development history of the 1962 Kadett. It has been alleged that GM was trying to conceal a new technique of platform and design sharing between Opel and its British sister company Vauxhall. Opel even built a brand new production plant in the Wester German city of Bochum for the car, so failure was not an option. The result was the new Kadett, a name that was last seen in 1945 - when the Soviets relocated the whole car plant to Moscow, where it became the first Moskvitch. This Kadett was a brand new car - though technically utterly conventional. It had a water=cooled 1 liter four-cylinder engine up front, which produced 40PS in standard form and 48PS in “high compression” spec. It was produced as a 2 Door Sedan, “Car A Van” and the top of the line Coupe version shown here. The Kadett featured a more modern design than the Volkswagen Beetle which dominated the market for small family cars. The Kadett offered more passenger space, more luggage capacity, and better visibility for the driver. Its water-cooled engine provided effective heating for the passenger compartment. However, the Kadett’s weakness became soon apparent - they rusted in a big way. The production run for the first Kadett was only from 1962 to 1965, when the more modern looking and slightly larger “B” model appeared. A total of 649,512 Kadett “A”s were built in those three years. Not bad, but not quite the perfect Anti-Volkswagen either. The model you are seeing here is a 1/43 Polistil model, Made in Italy at about the same time the real car was built. It is rather unusual in that the body is not made from metal, but from Fiberglass! The base is solid metal though. The fiberglass experiment didn’t last too long, as the bodies tended to warp after a few years. This example somehow has escaped this fate so far. 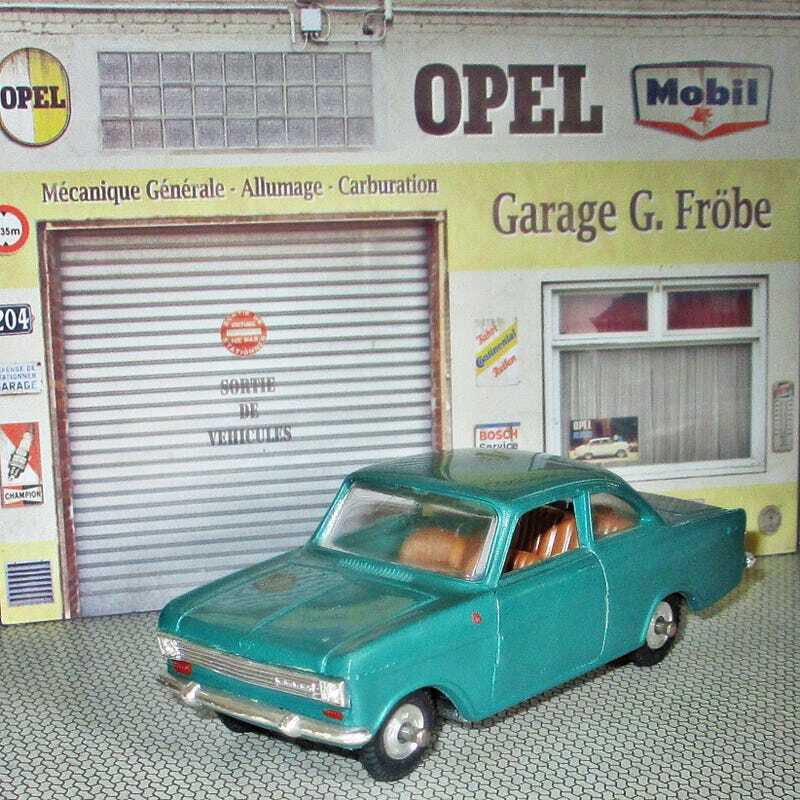 The metallic turquoise is a bit out of character though, the Kadett A was never offered in such luxurious paints. So much for this story from better times at Opel. As we all know, the brand was recently sold to PSA, the Bochum plant closed last year and the entire brand faces an uncertain future. Too bad really.